For the life of me, I’ve never been able to come up with a pithy answer! I guess I express myself for a living, which was particularly delightful to say back when I was breastfeeding my children. But I also help others express themselves. I’m a contributor to CBS Sunday Morning, doing stories on everything from the geometry of pasta to microdosing LSD and personal commentaries on everything from freezing my eggs to the scourge of vocal fry. I’m a panelist on NPR’s Wait Wait…Don’t Tell Me! trying to add levity to the week’s news and I’ve been the host of Science Goes to the Movies on PBS for five seasons, interviewing scientists about pop culture. I’m currently creating a pilot for NPR about the art of interviewing: midwifing people’s stories is one of the most fulfilling things I do. I also write personal essays, and my first book, Approval Junkie, will be a one-woman show at the Alliance Theatre in Atlanta in April 2019. I am the one woman who is performing it (and who has adapted it for the stage—gulp! ), even though I’m probably too old to play myself. Q: What’s something you love about doing what you do? My job—in all its various forms—is about connection. My task—which is my joy—is to connect with people, and then to help them connect with a wider audience. I’m given a gift every time I go to work, which is to unlock people’s stories, to reveal my own, and to try in my very tiny way to make the world a better place. One of my dearest friends calls what I do “living nakedly human publicly.” I love that idea. There’s no official end of business day for me, ever. Because what I do is also who I am, and because so much of what I do involves noticing, commenting, and expressing my opinion, I’m always writing in my head…or on my laptop…or jotting down notes on any scrap of paper. I’m therefore “working” in some fashion every day—morning till night—unless and until I consciously decide to clock out. I work during kids’ naps (which have all but vanished); I always work on trains, planes, subways, taxi rides; I write and rehearse in my head during runs in Central Park. I work on vacations—the day after Christmas while on holiday with my family, I was asked to conceive of a perfect Sunday Morning commentary for New Year’s that would be “non-political, hopeful, a little whimsical.” I spent Boxing Day trying to nail it while my husband got to frolic with the kids. When I choose to spend all or part of a work day with my children, I must work after they go to bed, preparing to interview someone or memorizing my lines or crafting jokes or writing my next essay or composing a script. I didn’t have my children until I was in my 40s. I’m still astonished they chose me to be their mother. My awareness of how precious their presence is in my life, and on this earth, is so acute as to be occasionally onerous (! ), and I don’t relish missing time with them. But the “balance” is how much I’m filled by what I do and also how much their existence buoys me creatively. Showing my children what it means for a mother to live a purposeful life. I often travel for work, and my kids aren’t crazy about it (which, is of course, good news—they miss me! ), but I always tell them, “I’m going away because I get to do what I love.” And I tell them about whatever story I’m working on. Right now, I’m finishing up an assignment on the lack of female monuments in our country, which has taken many months to shoot. I explain to my kids that out of about 5100 monuments in America, only 400 represent real women. And then when I’m back home in NYC, running with them both in the double jog stroller by the statue of Eleanor Roosevelt in Riverside Park, they have a new connection to the world around them. I feel doubly grateful to these generous strangers: they are helping me demonstrate to my little people that they can grow up to play their part in making meaning in the world. My children, Minerva (4) and Augustus (6) inspire me every day, multiple times a day. My son might, impossibly, be more feminist than I am. When he was five, he asked me, “Mom, I have two questions. One: who decided that girls get to have clothes that are beautiful and sparkly and boys don’t? and Two: was that person a man or a woman?” I LOVE those questions! He also asks if he can have a hug anytime he feels like he needs one, which I just think is so self-aware and vulnerable that it both makes my heart break and inspires me to live that honestly. My daughter is both fierce and spiritual. She lives with one foot always inside a land of make-believe, but she enrolls everyone around her in it. Her commitment to her imagination inspires me. She’s an inveterate improv comedy genius with an uncanny understanding of joke structure. I love that she’s a little girl who already understands what power it is to make people laugh. And she has a fascinating relationship with my mother, who died when she was close to my age now. I was 26 when she died; my children have never met her, but Minerva often invites her through our front door to visit me. If you haven’t yet seen the documentary “Won’t You Be My Neighbor?,” watch it immediately, and bring hankies. Just one thing? Here’s a start: I wish every woman on this earth would keep her real name upon getting married and that no one would use the antediluvian phrase “maiden name” ever again. I was recently rummaging through 50-year-old books from my childhood in my dad’s stiflingly hot Florida garage. And I was struck by how retrograde the stories seem—full of all the gender stereotypes I consciously try to avoid with my kids. Lots of stories of girls needing help or providing domestic caregiving for others. And yet…in my first memory, I’m sitting with my mother in a white rocking chair with a pink gingham cushion as she reads me The Giving Tree. In the book, of course, an apple tree gives herself to a boy as he grows up. In the end, the lad—now an old man—returns, and the tree can only offer him her stump as a place to rest. This tree is the ultimate woodland approval junkie: here’s all of me; use me, love me. At the end of the book, my mother’s voice breaks, and she wipes her eyes. On her lap, I feel happy. She is the giving; I am the given to. I have not yet gone to college to take Women’s Studies 101 and recognize the tree’s gender-predictable self-abnegation. I have not yet become a parent-stump to my own emotionally ax-wielding children. So I do not yet grasp that Shel Silverstein’s genius lies in the telling the story of parenting as an arboresque fable, because if he didn’t get all poetic about it, the real title of a children’s book about parenting would be, This Sh*t Is Hard As Sh*t.
Even though it took me almost forty years to learn it, my mother gave me this one book as a lesson. I'm running for U.S. Congress from Florida's 18th Congressional District, where I was raised. I'm a mom to Serena (16 months), a wife to Emily, an avid baker, a mediocre tennis player, a trained lawyer, a former Obama administration State Department official, and a consultant for the Albright Stonebridge Group. I love learning from and about the people in my community. Representatives are supposed to reflect the views and interests of their constituents, and that requires meeting people where they are, listening more than you speak, and being open-minded. Every day, I'm out talking with community leaders, teachers, business people, and first responders; homemakers, retirees, and students; individuals of every race, religion, and creed--and that is a unique honor and privilege. Women still face a great deal of skepticism and prejudice in politics. I've been asked: Can you do this job while being a parent? Can someone like you get elected in this District? And are you strong enough to face your opponent? Yes, yes, and yes, I say -- not in spite of being a woman, but because of it. Answering questions like these--which male candidates don't have to face--can be exhausting. But it's also an awesome thing to prove women's potential, to set an example through my leadership, and to pave the way for women who will follow. I am proud of publicly owning my identity. There are only three LGBT women running for the U.S. House of Representatives this year, and there is still a great deal of pressure for individuals in politics to remain closeted. I make a point on the campaign trail to acknowledge that I am a member of the LGBT community, and to make clear that, because of that, I'm committed to equality of opportunity for all Americans. Because when we elect leaders who represent the diversity of this country, we all benefit. My mom Nancy provides a daily dose of inspiration. She was in a debilitating car accident when she was 36 years old, and has suffered immeasurably since. But despite dozens of surgeries and hospitalizations, and a long list of daily struggles, she has never stopped caring for others: her children, her grandchildren, her neighbors, her friends. Through small acts of kindness she brings happiness to those around her, and reminds me every day that generosity brings more joy than resentment, and each one of us can draw strength from being compassionate and kind. As a kid, I went to an all girls summer camp. It was founded in 1913 by two women named Bert and Phil, who set about creating an environment where girls could become strong, independent, and fierce. I've always admired that they did so just after the turn of the century, before women had the right to vote, or full legal independence, or real leadership opportunities outside of the home. My summers there made me into the woman that I am today, and that wouldn't have happened without their vision and courage. I'd like to see equal representation of women in politics. This year, there are more women running for public office than ever before, but female candidates and office holders are still far outnumbered by men. As a society, we need to do more to encourage women to exercise leadership in the public sphere, and to address the myriad barriers to entry -- from wage inequality, to sexual harassment, to our broken campaign finance regulations. My absolute favorite picture book was "Going to School" by Felicia Law. It was a British book that I believe my parents had acquired at a yard sale, and it chronicled the school day of a bunch of children. They were just like me, except not. Their mothers pushed prams instead of strollers! Their skinned knees were mended with plasters, not Bandaids! The main character was named Roddy, not Ronnie or Ralph! I've long tried to pinpoint what it was that I so adored about this story, and I think it's that it was my first literary exposure to a world that was so familiar and yet so novel at the same time. And isn't that what all good literature is about -- transporting you somewhere new and yet making you feel at home. To learn more about Lauren, visit https://laurenbaerforcongress.com/. I run a new nonprofit called Public Rights Project. I founded PRP to train and equip a new corps of talented attorneys to fight for people's rights in partnership with progressive state and local governments. We recruit talented attorneys to work as 2-year fellows in state and local public law offices (state attorneys general, city attorneys, and district attorneys) and we help those offices bring impact cases to protect people's legal rights. It's so hard to pick just one thing. I love working with an amazing team to create something that addresses a pressing need in our country, especially in this moment. I'm passionate about the power of state and local government to be a force for good in people's lives, and I think it's especially important to show people what it looks like to have their government fighting for them at a moment when so many people feel under attack by their federal government. I feel incredibly lucky to be able to do this work. Everything! We're trying to create a new organization that does something new, and it turns out there's no set playbook for how to make up an organization. Every day I learn something new, and simultaneously feel like I can't learn fast enough. It's exhilarating and terrifying at the same time. Running a half marathon. All my life, I hated running, in part because of asthma and in part because it reminded me of being an insecure, chubby kid in gym class. A few years ago, I decided to run a half marathon with a group of friends who all hated running, just to prove we could do it. I've now run 5 of them, and love going for a run every week. I'll never be an elite runner, but it's a great reminder that we can push through the artificial barriers we often create for ourselves. Senator Kamala Harris. I had the privilege of working for her for several years when she was California's Attorney General, and then worked on her successful Senate campaign last year. I've learned so much about integrity, leadership, and public service from her. Her first and last question before any difficult decision is always, what's the real impact on people? That's her North Star, and she never wanders from it or allows herself to get distracted. She's taught me to never be satisfied with the status quo and to be relentless in fighting for people. She's also taught me the value of being at the table where decisions are made, and the need to always be vigilant about who's NOT at the table to speak for themselves. I hear her voice in my head every day as I'm working to build this new organization. Stephen Curry. This is really just an excuse to talk about my undying devotion to the Golden State Warriors and all things NBA basketball. In all seriousness, Steph inspires me because he’s at the top of his game professionally and personally. He has both the passion and the discipline to excel at his work, breaking new barriers in the sport and putting on a pretty dazzling display of talent. At the same time, he has his head on straight about the bigger things in life outside of work and is a role model as a parent. As if that wasn’t enough, he’s now really coming into his own as a public presence, talking about politics and race in a thoughtful way. All this before his 30th birthday! I aspire to have my life that together some day. I want every city and state in the country to have a public civil rights law firm for its people. We need to redefine what state and local public law offices are expected and empowered to do. For example, each city attorney’s office in the country should not just be the defense attorney for the city when it is sued; it should also be the civil rights law firm for the city’s residents, making sure communities can thrive and be treated with dignity. I started my legal career at the San Francisco City Attorney’s Office, where I had the opportunity of a lifetime to work on the trial challenging Proposition 8, the case that established marriage equality in California. I formed PRP to seed more of this work in cities and states around the country. We’re seeing more and more of them step up to protect their communities in the last year, from student loans and fair housing to the DACA and sanctuary cities cases, among others. Why should we place all the burden for enforcing our rights on nonprofits? The public should expect and demand that state and local offices do more to protect their rights. Where the Wild Things Are. It really fed my sense of adventure and imagination. I am a Ministry Innovation Fellow at Harvard Divinity School. What that entails is studying the emerging community landscape in America and trying to support leaders of innovative communities that are bringing people together at a time when we have a crisis of isolation in this country. The thing that brought me to this work was the trend among millennials in the US of disaffiliation from organized religion and the sense that religious community has been a really important location for people to form meaningful relationships that help them grow spiritually. And so, as that fabric has come apart, I started to wonder how might I be useful in fostering the rising generation of spiritual community, which seems like it will look very different from generations that have come before. At this point, my focus is on helping to build what I call the "infrastructure for belonging and becoming." Belonging has to do with a connection to one's authentic self, to other people, to this world (our shared home), and to something more, or what some call God. Becoming has to do with growing into the person you have the potential to be, and finding places where you can be formed so as to be both fulfilled and contributing meaningfully to making the world better. I get to be in relationship with the most inspiring people from the most unlikely places. In a single day, I can be in meetings with the founder of CrossFit and an Episcopal priest and someone who runs a contemporary Jewish mikvah and a theologian who is trying to make sense of the ways that people are using SoulCycle for spiritual experience. It's a fascinating combination of leaders from both the secular and religious world who are brought together by shared commitments that they sometimes don't even recognize until they are in relationship with each other. Getting to participate in cross-pollination that's in service of helping people to discover meaningful community and their highest selves -- that gives me great delight. We're living at this incredible inflection point where things are changing so rapidly that it can be both exciting and challenging. Religious institutions are being forced to contend with a lot of uncomfortable change that often manifests in people no longer participating the way they used to, if at all. On the other hand, you have this emerging ecosystem of innovative communities and their leaders who are responding beautifully to this cultural moment, yet are often disconnected from ancient sources of wisdom that could be vital to the success and sustainability of their work. So the task is bridge-building between institutions that are struggling to adapt, and fledgling communities that lack sustainable structure and a sense of history. Finding ways to foster relationships between those two landscapes is one of the most difficult parts of my job. There was a moment at a dinner when I had gathered 50 leaders from all over the country who are fostering community. The host of our meal was giving a blessing and the room was full of people who would not otherwise have met. The quality of excitement and kinship in the room was palpable and I had this feeling like, "this is what I'm for." This kind of gathering is something that I seem to have a special capacity to bring about. So I felt proud of that. My mom inspires me, among many other reasons, because of her fearless commitment to living in alignment with her highest values. I got to grow up with the fruits of that commitment manifest in my everyday life, so that meant I was raised with an extraordinary combination of love and creativity and spirituality. The more that I get to know the world of institutional religion, the more I realize how much courage and clarity it would take to forge the kind of path my mother forged. I'm inspired by the strength of her follow-through even, and often, in the face of adversity. Father Greg Boyle. He is the founder of Homeboy Industries in LA, which is the largest gang intervention rehab and reentry program in the world. Father Greg Boyle is a Jesuit priest who had lived a life in LA in which he witnessed the impact of gang violence for decades. The radical thing he did for the time was to start treating the gang members as human beings and to ask them questions about what it would take to make changes in their lives. Homeboy Industries now trains former gang members in social enterprise and has served about 15,000 a year for many years. What most inspires me about Boyle is his use of love as a strategy and his unflinching dedication to putting people first no matter what. He has identified violence as an outcome of the absence of hope and so his work is about fostering hope in a way that is tangible and transformative. I would like to be more like him when I grow up. I would like to see inter-generational community become the norm in our society. I would like to see young people have relationships with not only their parents but a circle of elders. I would like to see the older people in our society be treated as though they are potentially vessels of wisdom. I think the devastating isolation we're seeing among older and younger people in this country is solvable, but not without relationships. So the more we can do to consciously foster that in our own lives, the better. Annie and the Wild Animals by Jan Brett. The Picture Book Club will make a donation to Homeboy Industries, the charity chosen by Angie, for every purchaser who mentions this Q+A. I am a civil rights lawyer in Louisiana. I work through litigation and legislative advocacy to improve the criminal justice system here--to make it smaller and fairer to the people who go through it. I used to be a public defender. I loved representing individual people but sometimes felt defeated by the idea that I could only help one person at a time (and only in small ways, if at all) work against a system that ignores the humanity of almost everyone who is caught up in it. Now I work on larger cases and can think about ways to fix the entire system. This is not to suggest that success is easy or frequent, but when it happens it feels great. And I still often get to work directly with incarcerated people—some of whom are among the best folks I have met as an adult. The downside of working on campaigns that by their definition are styled to help a lot of people at once is, ironically, having to tell most people that you can’t help them. Because of my background representing people directly, I have an instinct to try to fix everyone’s individual legal problems even though my work is supposed to focus on the big picture. It’s difficult to work closely with people who are suffering and whom you wish you could help more. I’m proud that I moved away from New York City, where I grew up, and made a life in the wonderful and weird city of New Orleans. It was a decision I was scared to make because I loved New York and everything I knew was there. If I hadn’t fallen in love with a man who wanted to wander, and encouraged me to, I probably never would have been brave enough to leave and my life would have been far less rich. I have two tremendous sisters. One is a midwife at a hospital in the Bronx who goes on trips around the world by herself and also speaks four languages and has tons of books and cool art hanging on the walls of her apartment. She is, in addition, a deeply loving and wise person. My other sister is a brilliant actress, the funniest person I know, and the most loyal, in addition to being resilient, tender, generous, super smart and tough tough tough. Both of them have made multiple spontaneous trips across the country to help take care of their nephew, my son. I am so grateful to them for how much they love him—and me! I tend to admire successful women lawyers who stand up for causes I believe in, which is probably a predictable answer. Off the top of my head: Sally Yates, Vanita Gupta, Ruth Bader Ginsburg. I wish that we would invest heavily in resources that helped people avoid committing crimes—medical and mental health treatment, job training, education—instead of pouring billions of tax dollars into locking them up once they are accused of doing something wrong. The Picture Book Club will make a donation to The Orleans Public Defenders, the charity chosen by Meredith, for every purchaser who mentions this Q+A. It is not easy to answer this question quickly. My title is Deputy Director of the Social Performance Task Force (SPTF). SPTF is a non-profit organization that works in the microfinance sector, and though we are incorporated in the U.S., we are active in countries all around the globe. Microfinance is the provision of financial products and services (i.e., savings accounts, loans, insurance, remittances, etc.) to poor and vulnerable populations, and to other populations that are excluded from the formal financial sector. Some people are excluded because they live in such remote areas that no banks exist nearby. Some people are excluded because they are so poor that the amount of funds they might want to borrow or save do not interest banks. Some people are excluded for legal reasons, such as being refugees in a country where they do not have national identity cards or the right to work. Some people self-exclude, because they are illiterate, or embarrassed about their low social status, or disabled in some way, or for any number of other reasons. Women can be excluded, even if there is no formal prohibition on their activities, if their families or their husbands do not allow them to make financial decisions. It turns out that there are many reasons why people who could benefit from financial services do not have access to them. Microfinance began as a social undertaking, to increase financial inclusion, with a particular focus on microcredit. The initial concept was to give tiny loans to poor people. These would be just the right size to get poor people out of the control of the loan sharks in their villages, and to buy whatever capital they needed for their micro-businesses. The goal was not for the microfinance provider to make money. The goal was to help people engage in some income-generating activity and move themselves out of poverty. But something astonishing, to the outside world at least, happened. Poor people paid back their loans, with interest, on time. They turned out to be good clients. And they also turned out to have the same financial needs as all the rest of us, starting with needing a safe place to save their money. The sector grew enormously, and some financial service providers that sprang into being were motivated purely by the opportunity to earn a profit. These institutions, in some cases, have done a lot of harm. Clients became over-indebted. Clients had to sell productive assets, like their one cow, to repay loans, and then they ended up poorer than before. Clients were bullied, threatened, even jailed, if they failed to repay. Some clients committed suicide, which is a horrendous truth and I feel bad typing it, but it would be wrong to gloss over it. SPTF was founded as a way to respond to what was no longer working in the microfinance sector. We operate solely on donor funding, as a public good to the sector. We research and share the good practices of the financial service providers that really are living out their social missions. We also do a lot of work to help institutions that are not yet skilled in this area, but would like to be, to understand how to adapt and manage their operations so that they maintain their financial sustainability while also creating positive effects in clients’ lives. We educate investors who would like to invest in social sectors, because often they assume that any investment in microfinance will do some good, when in reality some institutions are making the world much better off and some are making it much worse off! We educate regulators. We basically talk to everyone and hope we are convincing. I love microfinance and I definitely believe in its potential. There are numerous success stories of families that can now educate their children, and drink safe water, and never again have to be hungry, and live in a warm and comfortable home, and feel hopeful about their futures and pride in their lives. But, it is also undeniable that there is such a thing as very bad, very harmful, microcredit in particular. It is definitely hearing from people in the field. My job does not involve any direct outreach to clients, and I often feel quite removed from the action. But, every once in a while, I get to interview someone who is doing something really innovative and inspiring and interesting. For example, I just heard a woman speak about how her microfinance institution is transforming education in Pakistan by making loans to schools, accompanied with a lot of technical assistance. The school facilities in many villages were so degraded as to be unusable, but now they are getting basic ventilation and electricity and generally are becoming places where children can learn. The program couples the loans for capital improvement with advice on teacher training and curricula. There is also an emphasis on sending girls to school. It is just a great program. A microentrepreneur in Rwanda stands in front of her store. I get really frustrated by people who speak so convincingly about their desire to do good but then in reality will only invest in microfinance if they get a “minimum” return on their investment that actually seems quite high to me. You have a billion dollars. Do you really need to make at least 15 or 20% on all your investments? I have been thinking about this since I got this question list a week or two ago and so many ideas popped up, but none seemed worthy! For example, my five-year-old son told me recently that all the kids in his school and his after-school said purple was not a boy’s color, but he likes purple. I am proud that he thinks for himself! When I was 25, I moved to France for a year and got a job doing accounts receivable in a hotel. It turned out to be a terrible experience working very long hours at minimum wage with people yelling at me all day long about errors on their bills, mixed in with some shady people ducking out on their bills and the head of the hotel yelling at me for not getting those bills paid. But I stuck it out, and I’m proud of that. I’m proud that my marriage is doing well even after we added three kids to it, because the early months after baby #1 was born were pretty rough! My best friend’s father died recently of cancer and I was looking at a photo taken some years ago of me and his dad that shows the two of us laughing, and I felt mostly grateful but also proud that I do generally take the time to get to know my friends’ parents. I once spent a year tutoring math to adults that were trying to earn their G.E.D.s, and at the end of my time tutoring – I was moving to go to graduate school – they threw me a pizza party to say thank you and the students also wrote me thank you notes. That was rare for a tutor, and I felt proud and pleased. It turns out that this was a very fun question. It gave me a chance to appreciate the little things. Thank you! My mom is an obvious choice. She works so hard to be excellent at everything she does and to be present and helpful in the lives of all of her children. Before she retired, she basically never got enough sleep and never had fun. I have my doubts about how healthy that was for her, but it was certainly an incredibly selfless way to live. She was also the first female partner in the law firm where she worked, a fact that has always made me proud. Martin Luther King Jr. I have been thinking a lot lately about how challenging it is to choose to meet horrific prejudice and physical threats with non-violent resistance. I think it is amazing, almost miraculous, and so very admirable. If I could instantly patch up the hole in our ozone layer and bring back the glaciers and ice bergs and home for the polar bears, and make all future carbon emissions harmless, I would! On a much smaller scale, I wish our local library were open on Sundays. Norman the Doorman, by Don Freeman. Norman is a mouse, and I was very taken by his cozy home inside the helmet of a knight’s set of armor in a museum basement. My father loves I Am a Bunny, by Ole Risom, and I feel I would be a bad daughter if I did not take this opportunity to mention it. It is a very simple story, but charming, with great illustrations. The Picture Book Club will make a donation to The International Rescue Committee, the charity chosen by Amelia, for every purchaser who mentions this Q+A. I am a writer and a leader who draws on science and technology to forge partnerships that improve the health of people and the planet. I work on climate change policy, and I write about ideas and discoveries. Every day, I get to act on the values I hold most deeply. I am passionate about seeking the truth and about justice, and about having good evidence guide efforts to serve the most vulnerable people in the world. I am constantly learning about new ideas and areas of research, and finding ways to bring people together to change how our society works for the better. This work stokes my creative fires and demands that I pay attention. Everything is challenging about it! That's part of what makes it worth doing. I'm proud of having served President Obama and the American people while working on climate and science policy in his administration. He led with dignity, grace, and intellect, and the work we did represents the true importance of the future and future generations. My mom inspires me every day. As a woman and a physicist of her generation, she accomplished a great deal while also being a wonderful mom. What I love most about her, perhaps, is that she's curious about everything, and she continues to learn and ask questions throughout her life, no matter how much she achieves. I'm inspired right now by the work of the writer Sherman Alexie. He has a bold, distinctive voice, and exudes a kind of authenticity and originality that it takes deep courage to express in our time. I'd like to see the true social cost to the next generation reflected in the current price of carbon-emitting energy sources. If we actually incorporated the price we and our children will pay for carbon dioxide pollution in a changing climate in today's price tags, we'd unleash incredible creativity and find new ways to fuel our economy and design our communities and infrastructure. I loved and still love The Lorax. And right now, I enjoy reading my niece the book What Do You Do With an Idea? The Picture Book Club will make a donation to The Southern Poverty Law Center, the charity chosen by Bina, for every purchaser who mentions this Q+A. Want to introduce a child to more awesome women? Check out our 12 Women Who Changed the World subscription! Want to learn more about Bina? Check out her website. I ask a lot of questions for a living. I think of myself as a translator of complicated ideas — through writing, editing, helping to produce videos, and planning events. Right now, I’m the supervisor of news events and projects at NASA’s Jet Propulsion Laboratory in Pasadena, California. This means I help pull together long-term projects in the news office, like planning the media activities around the end of the Cassini mission. Cassini has been orbiting Saturn since 2004 and on Sept. 15, 2017, it will fly into the atmosphere of the Ringed Planet and be squeezed to death by its atmosphere. I get to be part of exploring new worlds and imagine what it might be like at places like Saturn’s moon Enceladus or interstellar space. And then I figure out how to explain that to the wider world. At NASA and JPL, there are a million acronyms. When I first started working here, there were entire conversations where every other word was some abbreviation I didn’t know. This can be humbling — especially for someone who already felt like an outsider because I was an American History and Literature major among engineering, geology, planetary science, and astrophysics geniuses. But I like learning new things, so there’s a delight in figuring out what people are really talking about. Today, my 5-year-old was entertaining herself in the back of the car reciting witches’ lines from Macbeth — “Double, double, toil and trouble! Fire burn and cauldron bubble!” I’m just proud that I’ve been able to share something I love with her and it actually stuck. I don’t know how much she really understands of Macbeth — I can see her drifting off during the scenes that don’t have much action. She asked me whether there was a picture-book version. Do you have a recommendation, YiLing? My good friend Erika is a writer and a teacher and about to have twins. She’s so committed to keeping up with her reporting and writing, despite the fact that she has (and will have) an enormous amount of responsibility parenting. Sometimes I think I’m tired, but she’s still going and that makes me think I can, too. Michelle Obama: eloquent, graceful under pressure, and not afraid to do “The Dougie” in public. Richard Scarry’s Please and Thank You Book. When I went back to it recently to read it to my daughters, I realized that some of the roles for boys and girls were … um … dated. But the drawings of animals are still pretty delightful and the story of “Pig Will” and “Pig Won’t” is still a great one. The Picture Book Club will make a donation to writegirl, the charity chosen by Jia-Rui, for every purchaser who mentions this Q+A. Colleen, co-founder of #GivingTuesday, with her kids. My professional background is in corporate social responsibility, and currently most of my time is spent as mother to a 5 and 3 year old. However, 5 years ago, any spare time that I wasn’t using to catch up on sleep, I used to work with my husband and a team of influencers to launch a movement called #GivingTuesday. The idea was simple: a philanthropic response to Black Friday and Cyber Monday. A day of giving after two days of getting. That first year, 2012, we had 2500 partners and it was mainly focused in the US. This year #GivingTuesday currently has tens of thousands of partners and will be active in over 70 countries around the world. Watching how #GivingTuesday has grown exponentially each year has been incredibly exciting and so inspiring. This grassroots movement is built by individuals, families, organizations and communities who all want to come together and give back. It doesn’t work without the passion of every project, every act of giving. I’ve been so proud to watch the movement grow. It really showcases how generous people are and how creative the nonprofit world can be. It is so easy to measure philanthropic success in monetary value alone. One of the most challenging aspects has been not thinking about success purely in terms of the money raised. Each year we hear stories of how one small organization, community or family came together to celebrate this day of giving and I never want those stories to be overlooked. One favorite example this year is groups of dads who will be coming together all over the country to help pack and deliver food to those in need. Another is an online drive to get people to sign up as organ donors. These moments of everyday generosity matter so much. It is amazing to have been a part of something that is really developing into a new national ritual. In America, there are two days that are all about getting deals - Black Friday and Cyber Monday. #GivingTuesday is pushing its way onto the calendar too. That really gives me a lot of pride. 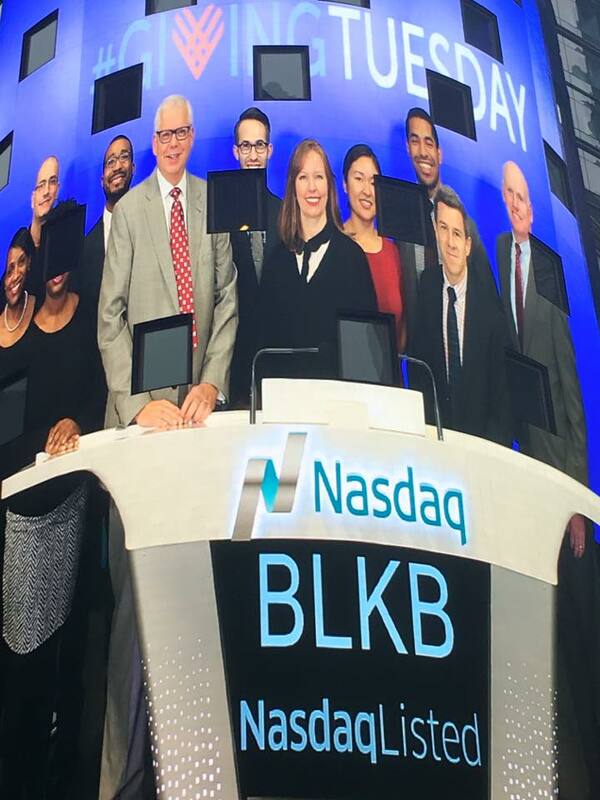 Colleen on a billboard in Times Square, ringing in last year's #GivingTuesday at the Nasdaq Opening Bell ceremony. My husband, Henry. Shortly after our son was born we starting thinking about the world he wanted for our child. He took an idea that started at our kitchen table, worked with an amazing group of people on this idea and through that first year, as our son grew, so did #GivingTuesday. Time and again I am inspired by stories of people who see a need in their communities and take it upon themselves to serve, to give, any way they can. I am so inspired by the people who run Giving Tuesday campaigns all over the country. The nonprofit sector doesn’t get the credit it deserves, but it is so entrepreneurial and dynamic. One great example is Dress for Success. They turned Giving Tuesday into “Giving Shoes Day” and collect shoes for women heading back into the workplace. I’m looking forward to joining that campaign this year. Horton Hatches the Egg by Dr. Seuss. I have such wonderful memories of reading that book again and again with my mum. From such a young age reading about the value in giving of oneself was very powerful. It also made me realize the value and reward of promises kept and taking responsibility. To this day, I truly hate when I have to break a promise to anyone. Also all the Hans Christian Anderson stories, especially The Little Mermaid. I remember understanding and being so moved by what she gave up for the Prince’s happiness - her own life. At 11 years old, I was outraged when I watched the Disney film and saw how they changed the ending! The Picture Book Club will make a donation to Donors Choose, the charity chosen by Colleen, for every purchaser who mentions this Q+A. Help The Picture Book Club support other great causes: for every 12 Women Who Changed the World subscription sold, we will make a donation to Running Start. For every Pick of the Litter Book Bundle sold, we will make a donation to Badass Brooklyn Animal Rescue. I create memoir-style comics. I’m Native-American and Jewish and I grew up in a small town in Oklahoma. I write and draw my childhood memories to educate readers about my tribe, the Muscogee (Creek) Nation, and issues of diversity. I love how rich in meaning childhood memories can be. Youthful experiences form identity. They also tell us how the world works. Sharing childhood stories can be a bridge to different perspectives. Everyone can relate to an awkward moment in middle school, even if our backgrounds are very different. Disclosing personal stories is difficult (for me anyway). I want to make sure there is a good reason to share. I feel a lot of pressure to tell the stories well! I am proud to be raising kids who feel free to speak up about what they are passionate about. Art from Emily's mini-comic, "An American Indian Guide to The Day of Atonement"
My mother inspires me. My dad died when I was nine. From then on, she raised my two sisters and me on her own. I think of her often when I parent my own three children. It’s a tough business to do on your own. About ten years ago, she retired early from the rat race so she could pursue her dream: she travels around the country hiking and doing trail maintenance for the U.S. National Parks. It energizes me to think how she is spending her days! Oprah. I struggled with this for a while because I thought I should choose someone more esoteric. But you know what? The answer is always Oprah. She faced many challenges, starting in childhood, and overcame them to become not just successful, but to become a POP ICON. She gives really inspiring advice in an approachable way. My Book About ME by Me, Myself, and Dr. Seuss was a childhood favorite. You filled in the book yourself, answering questions. Early on, it got me thinking about identity. Many fill-ins, like, “there are ---- windows in my house,” and “I have ---- teeth” didn’t really explain who you were. But other questions, like where you lived, were more personal. I remember thinking carefully about how to answer some questions. Should I check-off “country?” Should I check-off “suburb?” Country-living was more accurate, but suburban-life seemed far more cosmopolitan. Even as a child, I didn’t want to be pigeon-holed by external cues to who I was. The Picture Book Club will make a donation to the Standing Rock Sioux Tribe Dakota Access Pipeline Donation Fund, the charity chosen by Emily, for every purchaser who mentions this Q+A. I'm a journalist and New America fellow, and since last fall I've also been teaching journalism to masters students at New York University. I lived in the Middle East for several years, beginning in 2004, and, though I've been based in New York since 2009, I still go back to the region as often as I can. These days, I take my children with me on reporting trips, which means I work a little more slowly than I used to. My six-year-old, Alice, still talks about the weeks we spent in the United Arab Emirates during Ramadan a couple of years ago. She loved the decorations, and getting to stay up half the night. and keeps asking when we'll go back; she was fascinated by the indoor ski slopes and the mall where it rains from the ceiling! My first book, Excellent Daughters, which is based on my reporting in the Arab world, was published by the Penguin Press in January. I'm pretty shy, so I like having an excuse to talk to lots of different kinds of people. It sounds corny, I know, but I so love hearing people's stories, and it's such a wonderful privilege to be able to write them down and share them with readers. I can't write as quickly as some writers, and I tend to be a bit scatterbrained, so the constant deadlines are a challenge! My children, Alice and William. Alice just turned six, and Bill just turned three, so they're still pretty little. But they're both kind and helpful and hilarious, and really wonderful company. My dear friend Amber Scorah is, hands down, the most inspiring person I know personally. She lost her first child, Karl, last summer, when he was only three months old. He died on the first morning she'd ever left him, at a day care center she'd selected because it was close enough to her office to allow her to continue nursing. It's the kind of loss most of us can't bear even to imagine. And yet Amber has refused to let it define her or her family. She has written about her experience for the New York Times and USA Today and led a major bipartisan campaign for paid parental leave in the U.S. Karl's beautiful baby sister, Sevi, was born in June. Malala Yousafzai. I watched "He Named Me Malala" on a flight recently and, even though I'd read her book and was familiar with much of the material covered in the film, I was so amazed and moved that I kept bursting into tears and having to ask the flight attendant for more napkins. I loved The Church Mouse, by Graham Oakley, and Make Way For Ducklings, by Robert McCloskey. It's impossible to pick just one, but I especially loved the Frog and Toad stories, by Arnold Lobel. They were the first books I ever read independently, and I read them all over and over again. The Picture Book Club will make a donation to The International Rescue Committee, the charity chosen by Katherine, for every purchaser who mentions this Q+A. I run Padoca Bakery, a year-old Brazilian-inspired bakery on the Upper East Side of Manhattan. Our chef, Rachel Binder, and I came together almost 3 years ago to start to develop our menu and test recipes. I can't believe we have already been open for a full year! Connecting with people is definitely my favorite thing about what I do. A lot of our customers are at the bakery every day and we get to be a big part of their lives. We have seen couples bring their babies in their "kangaroo carriers" last year and those babies are now kids running around the bakery with their favorite Padoca muffin. Padoca is at 359 East 68th Street in Manhattan. Make sure to stop by if you're in the neighborhood; they make the world's best chocolate chip cookies! Building something from zero away from "home." I grew up in Brazil and, as much as NY has become my home, sometimes I still think I am crazy for doing this in a language other than Portuguese and without having my family around all the time. Marina once explained to an interviewer that, in Sao Paolo, "a padoca is a corner bakery, where the owner knows your name. I wanted to recreate that but also with something new." Sometimes I still face cultural differences at work that remind me of how big this world is, and it forces me to approach the situation from a different angle, which is always challenging. Resilience! It took me 5 visas to finally get a permanent residence in the US and I think it's safe to say that you need a lot of resilience to run your own business in NYC! My father. He finds inspiration in everything, which inspires me to do the same. He is a big believer in the "blue ocean" strategy, where instead of competing against companies that are creating similar products or services, you should create something completely new and even create a demand if necessary/possible. Just to give an idea, the two startups he is involved with right now have nothing to do with each other or anything he has ever worked with before. One is an Israeli company named Gauzy in the privacy glass industry. They make windows that allow you to change their opacity at any time and project videos/pictures onto the glass, transforming them into a TV or display. The other startup is Tonisity, which makes the first isotonic protein drink for pigs. You read it right: he is helping create this sort of Gatorade for pigs that makes them healthier and gives them a much better chance of surviving when they are little. How can you not get inspired by someone whose mind gets interested in such different topics? Alice Waters. I love to see how one person can empower such great change in restaurants all over the country and abroad when it comes to being sustainable, seasonal, and buying local. In one of her interviews she reminds us of how we should go back to "dealing with people and relationships on a human scale." In big cities like NY, it is especially easy to forget about nurturing relationships with the people in our communities, and with everyone who helps keep our businesses alive, so it's a great reminder! One of the greatest memories of my childhood is my grandmother reading me Sitio do Picapau Amarelo (translated as The Yellow Woodpecker Farm), a series of books written in the 1920s by Brazilian author Monteiro Lobato. These were books that she read when she was a kid!! Pretty amazing how they are still popular. The books are often compared to The Wonderful Wizard of Oz. They're fantasy stories that describe the adventures of 2 cousins while they explore their grandmother's ranch every summer vacation. I still remember playing games inspired by their endless imagination! The Picture Book Club will make a donation to Food Policy Action, the charity chosen by Marina, for every purchaser who mentions this Q+A. I create hair, skin and suncare products for the entire family. I try to instill values in my products and marketing that I feel are important to families. I love the creative process. Having an idea and seeing it come to fruition. I like that subtle color changes or wordsmithing can change a product or message completely. It is all in the detail. There isn’t one part of the business that is not challenging. But if it weren’t challenging, it wouldn’t be as gratifying. If you have ever made something from scratch – even a meal – you know there are a lot of moving parts. I am most proud that I was able to secure a World Bank Grant to plant a field of strawberries in Paraguay. I was a Peace Corps Volunteer and applied for funding to create an agricultural project for women. We had such fun growing these strawberries - a fruit they had never tried before! It was a gratifying two years. My father definitely inspires me. He is one of the most hard-working, caring people I know. He is the most loyal and trustworthy person. He lives life with incredible positivity and vigor. Since you focus on books, I will focus on my favorite author, Anne Frank. Her story is so powerful because she wrote with enormous strength, beauty and maturity. She had a wonderful soul which is articulated through her prose. The Red Balloon by Albert Lamorisse was a book I was mesmerized by as a child. It’s a story about a boy and his best friend, a bright red balloon. He follows the balloon throughout Paris which leads to many adventures and experiences with different people. You can win Babo Botanicals' Moisturizing Oatmilk Calendula Collection (sorry -- scrumptious baby not included)! See below for details. Want to win Babo Botanicals' Moisturizing Oatmilk Calendula Collection? Of course you do; it's perfect for newborns or anyone with sensitive skin looking for winter skin care solutions! Signing up for our mailing list (below) will get you one entry. Hop on over to our Facebook page or Instagram feed (@thepicturebookclub) for more chances. Giveaway ends Monday, October 3. I lead 100kin10, a national network committed to solving one of our country’s most pressing challenges: giving kids a great STEM (or science, tech, engineering, and math) education– by adding 100,000 more, excellent STEM teachers to America’s classrooms by 2021. More than just a coalition, we work to enlist a mix of diverse and powerful organizations to make strong commitments; we then amplify their impact through collaboration, learning, and funding; and then we catalyze solutions to large-scale problems by leveraging the strength of the network and its resources. I get to work with amazing organizations across all different sectors, from non-profits to schools to universities, corporations, government agencies and foundations, every one of whom wants to help make sure that all students get great STEM teachers. They’re doing that because almost all the world's most pressing problems require STEM-based solutions, yet only a tiny fraction of our population has the STEM knowledge to even be at the table solving them. So it's no surprise we haven't solved these challenges yet. To solve them, we need all of tomorrow’s problem-solvers to be equipped with STEM skills and inspiration. And tomorrow’s problem-solvers need excellent STEM teachers today to guide them. And that’s where 100Kin10 and its 280 partners come in. We’ve been working toward this goal since the President issued a call for adding 100,000 excellent STEM teachers to our nation’s schools over the coming decade in his State of the Union in 2011. By mid-2013, we realized that our approach — getting strong organizations to make strong commitments and supporting them with a suite of innovative opportunities to collaborate, learn, and access resources — was insufficient. Major challenges remained unaddressed, many simply too big for any one organization to solve on its own. To tackle those system-level challenges, we began to experiment with models to catalyze collective action to address large-scale shared challenges. At the same time, we realized that we needed to identify and map these big, systemic challenges in order to deliberately and strategically address them. Working with partners, teachers, and other sector leaders, we’ve been "mapping the waterfront" to identify these grand challenges. The hope is that we – and our 280 partners -- can be more deliberate and strategic about how to overcome the barriers that stand in the way of meeting our ten year goal, so that when we reach it, we won't have to start the clock all over again. But shifting our work from the critical efforts to enlist, prepare, and support STEM teachers to getting underneath the big, system-level challenges that have made something as basic as getting great teachers into all classrooms so hard in this country is really hard. It’s like asking ER doctors to move from the critical, life-saving work of treating the patients in front of them, to going up not just one level (diagnosing the underlying issues) but two levels (understanding why so many patients are coming in with the same underlying affliction). Launching and leading a high-performing social-change effort while giving birth to and raising three little kids and nourishing a strong relationship with my husband (i.e. mostly having a sense of equanimity and balance; underscore mostly). I’m inspired by my grandmother. She is 95. She and my grandfather have been married for 73 years. They’ve lived in the same house since the early 1950s. She came to this country as a refugee from Germany just before World War II broke out, having saved her family from the Nazis. She met my grandfather at a USO dance, she a recent escapee from Nazi Germany; my grandfather working on radar, classified. In quick succession, they danced, fell in love, my grandfather got his deployment papers, my grandmother followed him to his base in CA, they got married, she got pregnant, and he shipped out on a boat to the Pacific. She is whip smart but worked in a hair and nail salon to support her family, raised three children, became an amazing educator and artist, and eventually traveled the world with my grandfather, bringing us dolls, toy hats, and instruments from far-flung countries. In the last year, she’s begun to lose her memory to dementia, but much of what is left is love. I call her every Friday with my husband and three daughters and we sing to her, a song we sang to her mother, my great-grandmother, when I was growing up. We sing that she is a woman of valor. And she sings along. I am one of those people who is inspired and moved by all kinds of people, so this is a hard question for me. I’m inspired by the Pope, who has put justice and generosity at the center of an international conversation. I am inspired by the courage and fundamental optimism of the Black Lives Matter movement – that if we protest and take action, our country can get better. I am inspired by the glass-ceiling shattering of Hillary Clinton. There are more, but I’ll stop here. There was this series called Barba’Abba (in Hebrew) that my parents read to us that I adored. It turns out it’s French originally and has been translated into dozens of languages. They’re about this happy family of shape-shifting creatures, each one of whom has a special love (music, art, books, sports, science, etc.). They’re amazing. The Picture Book Club will make a donation to Luria Academy, the charity chosen by Talia, for every purchaser who mentions this Q+A. I’m a children’s book blogger and writer. My blog is This Picture Book Life. My debut novel for young readers is called Zinnia and the Bees and will be published in the fall of 2017 by Capstone. (Yay!!) And I also help other kidlit writers with their manuscripts by offering critique services. Process. The process of creating something is mysterious and hands down pretty great. I love having a story question and then going on a walk to think about it, recording brainstorms as voice memos. With process, you trust that if you wait and think and scribble and wait some more, the answers will emerge. And my very best moments are sitting down writing when in the flow of things. Process can be really fun. Also process! The process of writing can be challenging in that you don’t know how long it will take or what the outcome will be. My debut book is a manuscript I worked on for eight years in many different forms. I’ve also thrown a lot of projects away. Sometimes, you don’t know when or how or if you’ll come up with story solutions. It’s like shuffling around in the dark and you just want it to be morning already. Process can be really tough. I’m proud of my persistence. I don’t know her anymore, but I did know my English teacher my senior year of high school. She wore oversized red glasses. And she inspired me to study literature. She made me feel seen and encouraged and like maybe I had some potential. And she was inspiring in other ways too: she was sort of a nonconformist and she found a profession that she loved while helping others. I will forever be grateful to her and I’m confident I’m not the only student she inspired in her career, not by a long shot. The writer Aimee Bender was an early and big influence on me. I love the way her stories combine magical realism with everyday life. She is super smart and has an outrageous imagination. Her work is remarkably intelligent but still accessible. What’s funny is that my favorite picture book writer could easily be described the same way. Shaun Tan, too, is outrageously imaginative and combines magic and strangeness with the real world. They’re both huge inspirations to me and my work. This is an easy one! Benjamin Dilley’s Thirsty Camel by Jolly Roger Bradfield. Benjamin Dilley taught me that imagination is important and can (if you trust it to be powerful), bring about change in the world. Your imagination is your companion. And it might even create something that entertains, that helps, that drinks up a flood in the basement perhaps (a la that camel from the title)! I love the picture book-inspired crafts that Danielle includes on her blog! For the next week, The Picture Book Club will make a donation for every purchase made through our site to Reading to Kids, the charity chosen by Danielle. Danielle says, "I love the work Reading to Kids does and have volunteered several Saturday mornings to experience the magic of reading and crafting with kids myself. Plus, each child who attends a reading club receives a book to take home. Hooray!"